Electronic drums have become an essential arsenal for a drummer performing live, in a studio, or even for practice. But won’t an electronic drum set be a bit expensive just for practice purposes? Why not use something more affordable and look for the best drum practice pad first? The Movement Drums 12” Double-Sided is our top pick because it provides four different playing surfaces to accommodate the practice needs of just about any type of drummer. Playing on a drum practice pad helped me enhance my skills before proceeding to play the more complicated and challenging acoustic or electronic drums. If you want to know how practice pads are used, watch this video. I have prepared a review of six top drum practice pads in the market to help you narrow down your choices from hundreds and hundreds of drum pad brands available today. This guide is for drummers of any drumming skill level. The goal of this buying guide is to equip you with proper information before you head to the stores to buy a new drum set. I will show you the features, benefits, pros, and cons of my top 6 choices of drum practice pads. Read on to arm yourself with the right knowledge before deciding to buy one. 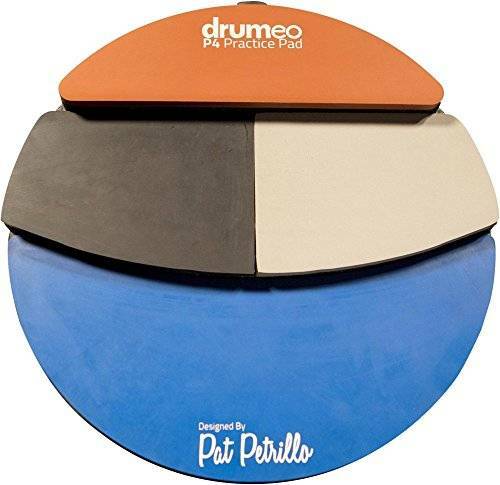 The Movement Drum Company has created a 12″ practice pad that provides 4 different playing surfaces to accommodate the practice needs of just about any type of drummer. This is an innovative and transportable pad to suit drum kit players, marching percussionists or concert snare drummers. 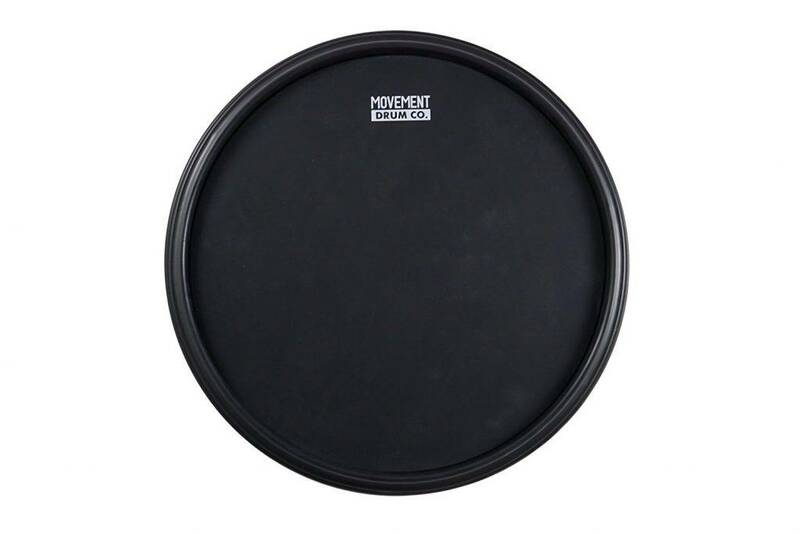 The Movement Drum practice pad features a top side with a responsive silicone rubber pad with a rim. And as the name (“double-sided” suggests), it also has a bottom, rimless side with a denser and quieter surface that keeps the pad steady while playing the rimmed side. 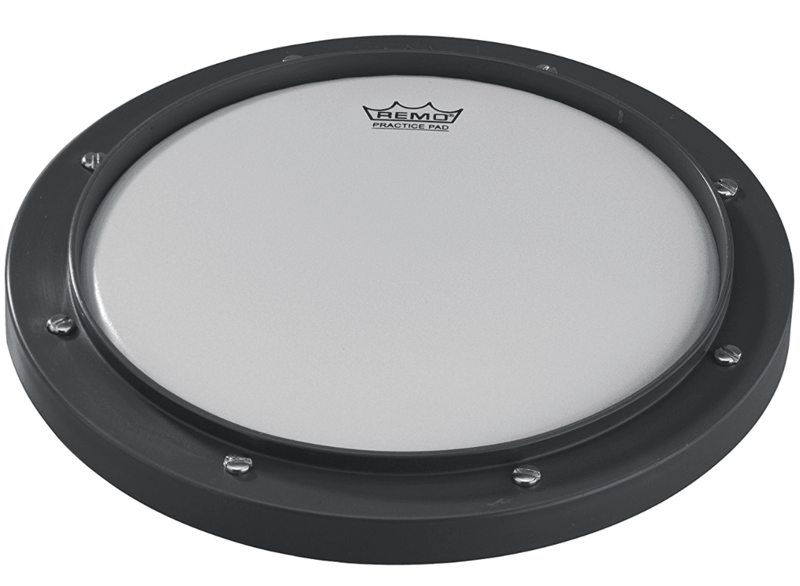 A clear polycarbonate insert can be added to emulate a crisp, tightly tuned marching snare, plus a softer, quieter conditioning pad insert provides less rebound when swapped in, to help develop drumming technique. 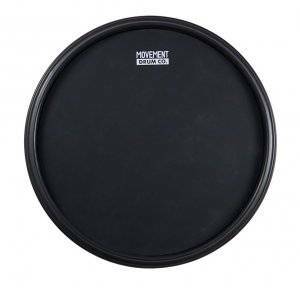 As such, the Movement Drum double-sided pad is a near perfect practice solution for most percussionists and unlike pads with multi-surfaces on one side and at different levels, this pad will suit the back sticking and cross-sticking requirements of drumline players to perfection. Great for practicing stick techniques and enhancing speed and control. Made of premium quality rubber on both sides of the pad. Feels realistic when the hard side is played. The brand boasts its authentic drum feel because of its wooden base. Some quality issues such as curling of the sides of the pad after a few days of use. 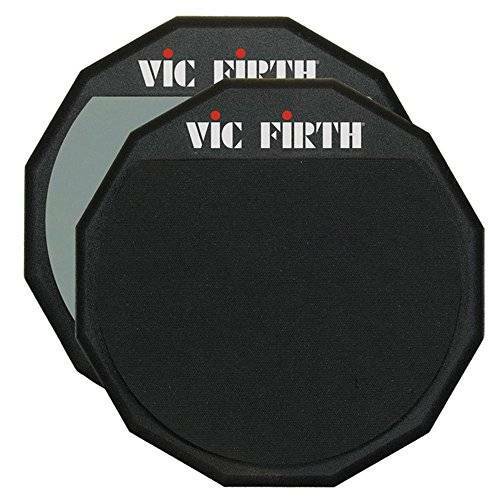 The Vic Firth practice pad is an outstanding 12-inch double-sided practice pad (in my opinion), which is very useful for both soft (quiet) and hard (loud) practicing. No need to buy two different pads that serve different purposes. With its soft rubber, you can practice quietly while everyone is fast asleep, and with its hard rubber, you can intensify your performance (in case you get carried away). The Vic Firth‘s two sides provide two different intensities depending on your mood. Provides versatile practice experience, especially for beginning drummers because of its “two-sides-two-feels” feature. Perfect size for a drum pad – not too small nor too big. The price is just right for a trusted drum pad brand. At 12-inches in diameter, it is close to a real snare drum. Natural gum and good quality rubber that provides a realistic drumstick rebound. May have some quality issues such as nasty chemical smell and visible glue marks on the wood and rubber areas. Slightly heavier compared to other practice pads I have tried. The Evans 2-Sided practice pad is convenient to play with because of its large playing surface that easily fits into any standard snare drum basket. I love the gray finish and the fabric, which is durable and resistant to wear-and-tear. The gray side is quieter and offers greater rebound, while the black side sounds louder with less bounce when you hit it. Both sides are perfect for practicing depending on what the situation calls for. The best benefit you will get from this 2-sided pad? There is no need for you to buy two different pads, so it saves you extra bucks to buy other accessories for your drum set. More affordable than its high-end counterparts. Comes with free 5A drumsticks. Eco-friendly with no nasty chemical smell. No marks are left on it when played. The blue coating may start to peel off after weeks of use. The free drumsticks that come with it may break easily. Another 12-inch practice pad, which I totally would recommend to beginners. Apart from the visually appealing finish of this pad, it is odorless. No chemical smell to ruin your playing experience. It may not feel as real as Evans 2-sided practice pad, but it is definitely worth the money. Tosnail is very bouncy, but fun to play. It is so durable, stable, and does not leave any marks when you hit it. The best benefit? It already comes with a pair of 5A drum sticks, not as durable and well-made as branded drumsticks, but works just fine for a start. Handmade with premium quality, manufactured in the USA. Four different pad textures for sound versatility, accuracy, and consistency. Just the right bounce with surprising densities per pad section. Made of durable and reliable materials. Makes practicing rudiments a bit more challenging. Fits on a standard snare stand. The pads that represent the toms do not sound and feel as real. The Drumeo practice pad is like a four-piece drum set that lets you achieve four different sounds. Talk about versatility! If you are looking to develop accuracy and consistency, this is best for you. Of course, the price is higher, but you get the reason why. Drumeo allows you to develop different stick and drumming techniques. You can create realistic drumming movements because of the placement of the 4 pieces. You’ll get to play the snare, cymbals, and toms. The toms do not sound like real toms, but you still get the idea of when to hit it and how to hit it depending on the song you are practicing. Non-slip and non-scratch with its protective rubber bottom. Easy to mount on a stand, table, desk, or any flat surface. Not as quiet as the other brands discussed in this guide. Does not replicate the sound of a real snare drum. 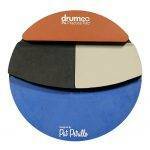 This Remo practice pad is tunable and can be placed practically anywhere. Purchasing a stand is not necessary because you can mount it on a table or even on a desk. I find the size a bit small though, but could be perfect for beginning junior drummers. By feel, it can replicate an actual snare drum, but by sound, I think the manufacturer could use a little more product improvement strategies. Still, I do think the Remo practice pad is just right for beginners, especially considering the price. It may be too small for professional drummers, but hey, its size makes it super light and portable. Whether you are a beginner, intermediate, advanced, or professional drummer, practice is a necessity. Even professional drummers who have had years of experience touring with popular Billboard artists need a refresher to maintain their skills and perhaps, acquire more techniques. Remember, playing instruments is a continuous learning process. The best drum practice pad is versatile, with a friendly control interface, where you can access the drum kit sounds appropriate for a particular music genre. This is beneficial for you if you are a working drummer because you will be ready to play different music styles such as jazz, classic, rock, or pop instantly. Similarly, if you are a beginner, you’ll get to practice and learn about the different genres early on. 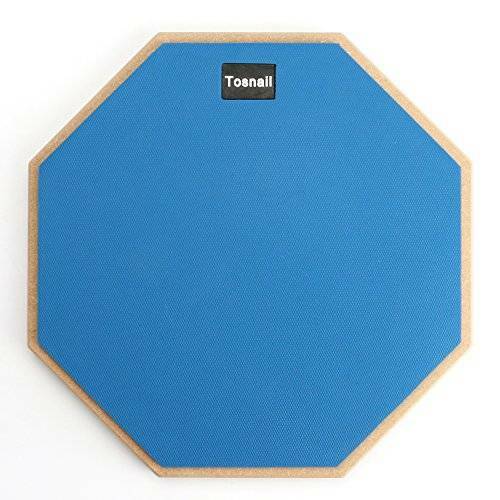 To make the most of your budget, look for brands with two-sided drum pads, which are perfect for practicing and enhancing stick techniques. Usually, one side is soft, bouncy, and quieter, while the other side is hard, more challenging to play, but louder. By picking a double-sided practice pad (instead of 2 one-sided pads), you can save money to buy other drum accessories. If you are living in an apartment or a dorm where space is limited, you cannot bring your acoustic drum set with you. With practice pads, you will still be able to update yourself with drum and stick techniques from time to time wherever you may be. Most drum pads are lightweight and portable, so even kids can carry them around with so much ease. If you are a beginner, I highly recommend practicing with pads first before upgrading to an electronic drum kit or a real acoustic drum set. 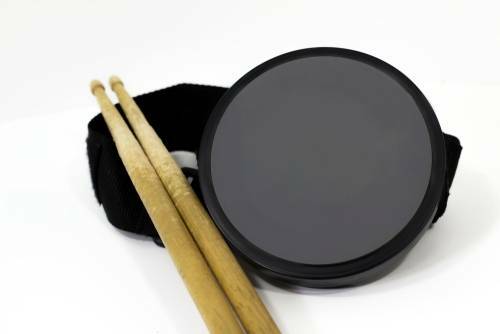 A drum practice pad is what you need if you have neighbors, roommates, or family members who have been complaining about all the noise you are making while practicing with an acoustic drum set. Most drum practice pads have a near-quiet performance and will not make loud sounds like a regular drum set. So which is the absolute best drum practice pad, you ask? The Movement Drum Double-Sided is the last pad standing for me. You can play this straight from the box and take it anywhere you go. A stand is not necessary, but if you ever feel like using a stand for upright and stable playing, you have the option to buy a separate snare stand. Tell me what you think about this review. Was it helpful for you? 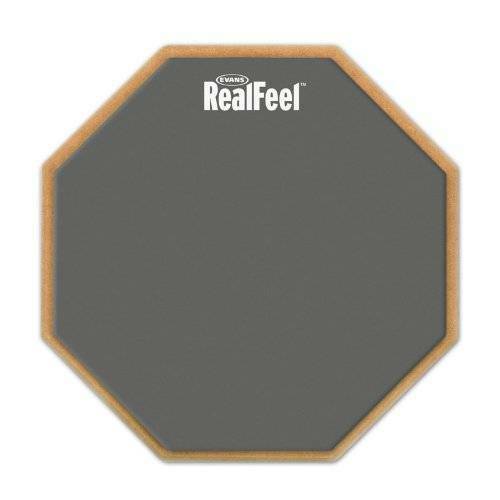 Do you have any questions about or disagree with this take on the best drum practice pad? Let me know in the comments below! If you’re serious about practicing the right way, also check out my review of the world’s first wearable metronome by Soundbrenner. I took one of my practice pads and modified it with a small pillow and alternate surface to the gum rubber. If you play only the gum rubber pad too much, the real drums won’t feel right. I actually sent back my mesh head ekit for this same reason. It was untraining me. I’ll stick to pillows and I use a roc n soc throne top as my floor tom so I am still moving “around the kit” while I’m practicing silently. I also have a second double pedal for my practice kit and a kick pad l so I don’t leave out my feet while practicing. I added a hihat stand with just the clutch on it to simulate that aspect as well. I have seen a huge jump in my drumming with this setup. Cheers! Thanks a lot for sharing that, Glen! Hearing that is really valuable for me, and I’m sure it is for other readers too! Let us know if you discover anything new in terms of kitless practice. Cheers! This was a very helpful guide; thank you for putting it together. Thanks a lot, Paige. My pleasure! I think you should check out the new ToneAlly, which has just won School Band and Orchestra Magazine “Best Teaching Tool for Beginning Students for 2018” at NAMM. See Thomas Lang and others try it out on the Youtube channel. Thanks for the hint, Gerard! Looks like an very good idea at first sight. I will dig deeper! The worlds first Dual Knee Pad. Would indeed love to see them. But where? Hi. I have just purchased the Drumeo Pad and am quite pleased with it. The main disappointment is the texture and quality of the the grey pad on the right which is meant to replicate the floor tom. I’m not a heavy hitter, being 55 years old and in a Church Gospel Band, but it arrived from Drumeo yesterday and this morning practicing some rudiment hit the grey pad on the front edge and a small piece of foam came away! The other pads are fine but I fear over a short time this pad will disintegrate, it appears to be even sensitive to a finger nail mark, so be very careful. Waited with great anticipation but disappointed with the quality. It arrives in a heat sealed clear cover that, on my pad at least, has creased up in 5 places the underside foam backing! Thanks for your review. Paul. Thanks so much for sharing your experience with the Drumeo P4 pad. I’m sure this will greatly benefit other readers – so I highly appreciate your input.